It's a concept that we've seen before. In 2013, Philips introduced its HTL9100, matching a soundbar (with detachable surrounds) to a subwoofer. Two years later, it followed with the Fidelio B5. Now JBL has embraced the idea. It's also embraced the £600 price tag that Philips assigned for its multipurpose products. The USP of the Bar 5.1 is that its surround speakers are entirely cable-free. Unlike the wireless accessory packs offered with some soundbars, these don't require a mains power connection. Instead, they charge their internal battery when docked to the 'bar. JBL says to get to a full charge takes around three hours, and subsequently offers around ten hours of playback. They will go into standby (or power down) if not receiving a signal after 10 and 20 minutes respectively, helping to keep their juice levels up, and can be physically powered down via a switch on their bodywork. But note that they only charge when the 'bar is in standby mode, not powered up, which might be a bit of an irritation. 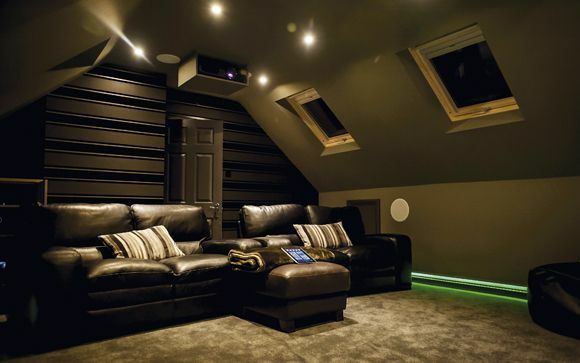 When the surrounds are locked to the soundbar unit, the whole shebang measures over a metre wide. Styling is quite neat, however, with a slim, curved, black-wrapped chassis topped off by source, volume and power buttons, and a JBL logo on the front. A scrolling display appears to the right of this, peeking through the grille, large enough to read from across a room. Controlling the Bar 5.1 is via a remote that impresses with its layout (and separate volume controls for subwoofer and wireless surround), but feels about as rugged in the hand as a plastic toy from a box of cornflakes. Boosting usability is the soundbar's generous connectivity. There's Bluetooth, which is par for the course these days, but also a USB input for music playback. To connect to a display, there's either optical digital audio or HDMI ARC, the latter joined by a trio of HDMI inputs able to pass 4K HDR signals. There are 11 drivers split across the soundbar and its two surround buddies. The L/C/R channels each get a pair of 3in x 1.75in racetrack drivers and 0.75in tweeter. There are no height pretensions here (Dolby Atmos or otherwise); all are front-facing – something to remember when positioning the single-driver (midbass) surround modules. The subwoofer, which stands 44cm high and around 30cm deep, perhaps seems a little outsized compared to the svelte soundbar. But its portly figure is justified by its 10in downfiring woofer, larger than most designs found in soundbar packages. It connects wirelessly to the 'bar. There's a pairing button on its rear, below a large port, but I didn't once have to press this. So, depending on how your AV source gear is configured, you could set up the Bar 5.1 with just a single wire from your TV, and no other cable spaghetti to worry about beyond mains leads. Neat. Unsurprisingly, the JBL Bar 5.1's 10in subwoofer has a lot of impact on the system's overall performance. Its level is adjustable from 0-30, and is set to 16 on default. This gives you a decent amount of flexibility, and a chance to experiment. I was tempted to keep the sub running hot to round out the performance of the other drivers (and because, erm, I like bass), but this naturally means it can suddenly sound over-bearing during weighty moments. I ended up with it set at 17. Explosions, punches, LFE swells, crumbling buildings... the Bar 5.1 loves them all. It has a gutsy attitude, and imparts generous scale to onscreen action, while sounding pleasingly tight. The climactic fight between Creed and Conlan in Creed (Blu-ray), sees boxing gloves land with taut, meaty thwacks. The Bar 5.1 surround enclosures may be small, and use only a single driver, but they get the job done. When mounted to the 'bar, the soundstage is entirely in front of you; switch to 5.1 mode (which is as easy as just removing the speakers and placing them either side of your seating position) and the 360-degree crowd noise of the Creed fight (actually the screaming hordes at Everton's Goodison Park, fact fans) immediately becomes apparent. The soundstage envelops. Localised effects, such as Sylvester Stallone's instructions from Creed's corner, come at you left and right; when the score kicks in after a successfully landed punch, it plays out in both surround channels. Again, though, levels have to be managed and distances considered. These speakers are too diddly to be standmounted, and although they are supplied with brackets for wall-mounting, this seems unlikely as they will need to return to their mother ship for power every once in a while. You'll need to put them wherever you can, and unless you have very specifically placed shelves, you won't end up with the recommended ITU configuration. To tackle this, JBL supplies a setup mic, which sets levels and delay timing based upon speaker position. It's a quick process, and saves you time tweaking volume (particularly as the remote doesn't allow for isolated adjustment of the left and right surround). It improved the balance in my room, but I still felt that soundmixes with very aggressive surround info, such as the helicopter crash sequence in Kong: Skull Island (Blu-ray), could dominate the performance at the expense of front soundstage delivery. With this disc, I had to lower the level manually. Furthermore the surround speakers have a different overall characteristic, where their audio sounds more shut in than that of the main 'bar. Get them too loud in the mix, and this can be obvious at times. Some trial and error is therefore required, and more user input (even as far as repositioning speakers) than you'd usually expect from an AVR-driven system. At times, however, the multichannel presentation of JBL's package slots lushly into place. With Blue Planet II (UHD Blu-ray), I was pleasingly cocooned within its soggy 5.1 soundscapes, where Hans Zimmer's score battles against ocean sprays and clicking dolphins. The JBL Bar 5.1 has sound presets for Music, Movie, Standard, Voice, Sports and Night. When using the soundbar in 5.1 guise, Music and Voice sensibly deliver a mono mix to each enclosure. Night mode aims to flatten dynamics of incoming Dolby and DTS bitstreams, although I found it didn't make much of a real impact. You might think Music is the way to go with your library of streamed and physical tunes, but in one way I preferred the general frequency balance of Movie regardless of content. Def Leppard's glam rock anthem Let It Go (from 1981's High and Dry) sounded lightweight with the Music preset engaged, missing out on a fuller, bass-rich presentation. Of course, with this setting, the JBL will matrix out info to feed to those rear channels, and this can sound odd at times – with Michael Jackson's Billie Jean, Jacko's main lyric remains front and centre, but some of his occasional vocal tics ('Ow!') are thrown wide. For music sessions, I'd perhaps advise reconnecting the speakers for a straight stereo experience. And it's with music playback in general that the Bar 5.1 shows up a lack of mid-range presence. As noted earlier, the woofer here is vitally important to the overall soundscape; with numerous tracks I found upper-register bass notes lacking the weight of genuine lows, illustrating a weak point around the crossover between sub and mid-range drivers. Treble info can sound more dominant. JBL's Bar 5.1 is a better bet for movie playback – which is no doubt the idea. Its impressive subwoofer adds a rich undercurrent to its multichannel staging, and dialogue is another strong point. The surround channels can feel a little underpowered compared to the rest of the array, however, and you'll need to find a spot for them that both works sonically and for your room layout. Definitely worth considering if a separates system is off limits and you still want to savour your 5.1 sources.